At some point, you just have to surrender…and give up control. I used to get quite apprehensive about flying. I had to sit by a window…seeing where we were in relation to the Earth below…keeping my eyes fixed on the horizon. At night, I had to see the lights of the cities and towns below. It was OK flying serenely above the clouds…but flying through them…buffeted about in the turbulence… was another story. I picked up the girls at the kennel early this morning. They were glad to see me…to be going home again. We were both in strange places this week. Amy…who works at the kennel, told me that they recently lost their lease, and that they’ll be closing in a couple of months. She was devastated…saying that she finally had found something she loved to do…and that it would be hard being jobless. But, she had faith in God…even though at times she found it mighty hard to understand what He has in store for us. All I could do was to give her a hug and tell her to hang in there. Lately…I’m learning to surrender…to give up being in control. I now prefer sitting in an aisle seat when I fly…and I find myself closing my eyes when taking off…and when landing. Learning to trust more. Late last night…descending through the rain clouds…I opened my eyes and looked out the window. A bejeweled city lay below…her lights twinkling through a fine gauze of wispy clouds. This is home now. This is where I have to make a stand…and at the same time surrender…and trust that we’ll all make it through the storms…to a safe landing. Dropped the girls off at the kennel this morning, so I’m spending this Saturday alone…doing the laundry and cleaning the house…in preparation for my trip tomorrow…want it to be clean when I get back. Opened all the windows this fine Spring day. This morning, I drove ‘up the hill’ to visit my neighbors. Randy said that the ‘old folks’ used to say that when you hear the whip-poor-will call, that means Spring is here. I heard the whip-poor-will early this morning. I’m sure we will still get some cold snaps…but a change of season is definitely in the air. It’s been in the eighties most of the week. It’s funny how I expect the dogs to react to everything that I do around the house. And it’s strange to look around for them out of habit, expecting that they’ll investigate every little thing that I do…especially in the kitchen, where there’s food….or when I open the front door. But today, I’m missing their presence. All I’m hearing are the birds outside…through the open windows…letting me know that Spring is here. Just a reminder…there’s a celestial two-step going on lately. Look to the west after sunset…you’ll see Venus and Jupiter doing a do-si-do through the heavens. And there’s a beautiful crescent moon thrown in for the asking. Tomorrow night…I’ll be checking it out from the West coast. There’s a sweet sense of anticipation in the air this evening that I’ve never experienced before. This mid-March day was marvelously warm with the temperature in the low eighties…and this evening so quiet…so still…already laced with a gentle chorus of crickets and the occasional twittering of chipping sparrows settling in for the night. The bare branches of the sweet gums have a fullness to them against the paling light in the west…their leaves ready to unfurl…to begin again their discourse with the sun. It’s as if nature is whispering…that something is coming…something very good. Time travel makes me tired. Especially, travelling into the future. Suddenly…I’m temporally displaced. I know that it’s only an hour…but it takes awhile for the present to catch up…for things to return to normal…to get back in focus. Even the birds have an eerie sound to them tonight…in the grey twilight…as if their plaintive chirping is echoing into this future from the slightly out-of-reach present…struggling to catch up…to get back in sync. A ten hour day at work probably didn’t help either. Driving home today…the cherry, dogwood, and pear blossoms…everywhere on this warm, glowing, hazy Spring evening. A fairy tale landscape…but missing the happy ending. Suffused with sadness for some vague reason. I need to go to bed early tonight. Maybe during the night…while I’m asleep…the present will catch up with the future…and then the morning will arrive on time…and everything will seem clear once more. Taxes are done…Yay! It’s amazing that the time we spend procrastinating and fretting over things that must be done is usually much longer than the actual time it takes to do whatever needs to be done. Ralph Waldo Emerson once said, “Do the thing…and you will have the power.” I think he was right. Yesterday morning, I took Belle in to the vet to get her shots in order for this year. I’m heading out to California next week, so the girls have to be up-to-date on their vaccinations to be in good standing at the kennel where I board them while I’m out of town. An unexpected surprise was that, during a consult with the doctor about some patches of rough skin on her back, the Doc recommended a geriatric panel of blood work be done, since (like TInker), she has the symptoms of hypothyroidism, which is somewhat common in Pomeranians. If that’s the case, it can be controlled with the same medication that Tinker is on now. I guess the three of us are destined to grow old together (the girls are both eleven). Although, I think that in the last year, I’ve spent more on veterinarian bills than on healthcare for myself. The vet bill from yesterday alone was three hundred dollars. I think we should lobby that pet care should be included in our health insurance programs. Later in the day, when I finally got around to sitting down and doing my taxes (it actually took less than an hour), I was seriously considering whether I should claim Belle and Tinker as dependents. On reconsideration, the IRS would probably end up flagging that for an audit. So…having done the thing yesterday…today I have the power. I used it to sit out on the porch, feeling guilt-free, reading, and generally just enjoying the beauty of a cool, sunny day…the cerulean sky, only slightly smudged with some blurry cirrus clouds very high above the peaceful earth…the dogs at my feet. A Phoebe paid a visit to a bare branch of the fig tree next to the house…and serenaded me before winging off into the woods. At times, up in the sky, I spotted comets, with long wispy tails trailing behind (or, witches on broomsticks? )…and flying monkeys soaring in lazy circles…riding the thermals. For a while…it felt like I was in Oz. In reality, they may have only been airplanes, high in the stratosphere…and black vultures on patrol…but even that is enough magic for me. Today…I have the power. 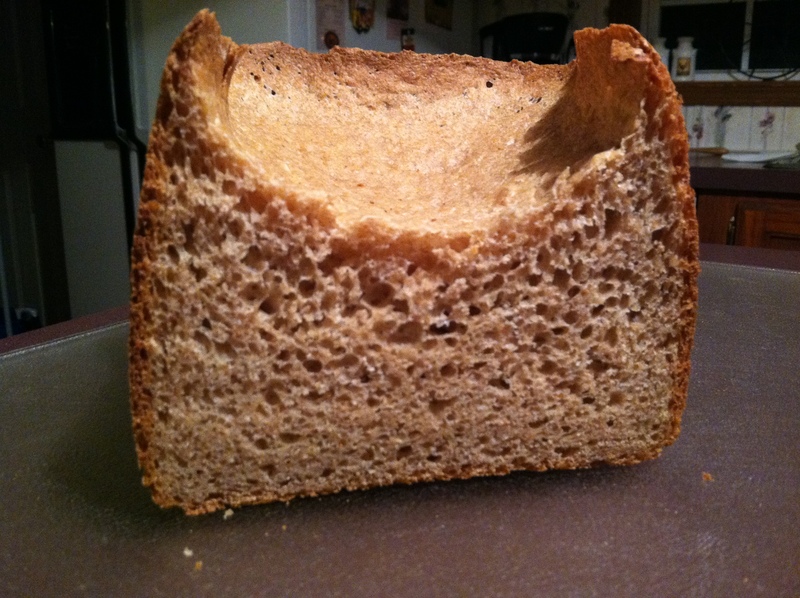 My first attempt at baking a loaf of whole wheat bread left me a bit crestfallen…or is that…crustfallen. Instead of the 1 1/2 teaspoons of yeast that the recipe called for, I added the whole packet…thinking that ‘more is better’. I’m learning that, sometimes…less is more…and that I shouldn’t try too hard to get results.